At CHINAPLAS 2015, Domo Chemicals announced that it has invested in a new polyamide (PA) compounding plant with 20,000 tons total capacity at its existing site in Jiaxing city, Zhejiang Province, China. A second production line is expected to be fully operational by the end of this year. The total capacity will reach 20,000 tons by 2019. 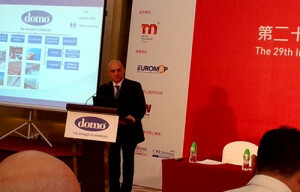 Ludovic Tonnerre, Managing Director of Domo Engineering Plastic Asia, said the company in the middle of transformation from a feedstock player to become a nylon expert. “Our plan is to become a solution provider by 2018,” he stated. Domo’s new plant will serve a variety of products including Domamid PA 6 and PA 6.6, as well as high temperature nylon (HTN) functionalized compounds to serve the automotive, electrical and consumer goods industries. With strong emphasis on environmental awareness, the company is taking one step ahead by processing at the site Econamid and Econamid Oro, two engineering polymers range based on post-industrial waste feedstock, offering a greener PA for the Asia market. “We believe there is huge prospects for such materials because the world is calling for more eco-friendly options as required by more stringent regulatory standards,” Mr Tonnerre said, citing that Econamid helps to reduce 75-90% CO2 emission and 49-65% energy consumption compared with virgin materials. All of the pre-consumer waste feedstock comes from China itself, he added, which is another contribution for sustainable production.